I had a very productive month! I finished my Valentine patchwork quilt and two comfort quilts from start to finish! I got my Hillside Houses quilt quilted and bound. Isn't that texture fantastic! This was quilted by my friend Cyndi at our LQS The Dancing Bobbin. It is backed with this fabulous metro circles fabric. And it is bound with scraps of the shot cotton used in the houses. I'm just so happy with this finish!! Also quilted by Cyndi this month is my second Farm Girl Vintage quilt. It is ginormous! These inside winter photos just don't do this quilt justice. It is so vibrant and fun. And of course, it has a scrappy binding. This is another long overdue UFO that is now FINISHED! I completed and quilted this top last year and then it sat and sat just waiting for a border to turn it into a real quilt. Done! I picked a vibrant green for this border. It is perfect with the front and those gorgeous raspberries on the back. That's a total of 6 quilts completed this month! But I also finished my Polaroids top and made progress on some other WIPs. I have 23/25 Scrappy Bear Paw blocks done and 33/40 tulips made for the Purple Sewing Challenge. All of the blocks for my long distance quilt along with my Aunt Charlotte are complete and I've started to work on the sashing. I am really excited about seeing this one come together! I love looking back each month at what I've accomplished. It really makes me look forward to the month ahead!! Wowsers!! You are a machine!! 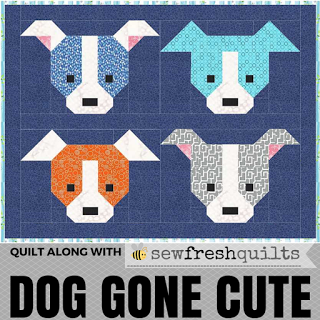 :) Your finishes are fantastic, seeing your Hillside Houses quilt makes me want to make one! It is awesome! Your creation of new WIPs looks pretty impressive as well! What is that last one? Are you improviing or following a pattern? It is all kinds of wonderful!! Lots of great projects happening here! I love your GW, yummy fabrics! Gosh you are busy!! Lovely fabrics in your Gypsy Wife, it's good to see more bloggers linking up. i'm wondering when on earth you have time to eat or sleep?! wow! busy month is an understatement. and you've made two farm girl sampler quilts? amazing. thanks for linking up your gypsy wife section one! glad you're on board with us. it's looking great! Love Love LOVE your Hillside House Quilt !!! All of your quilts are gorgeous... The scrappy bear paws are beautiful with the dark background. Impressive lovely quilts. The hillside houses is my favorite. but the farm girl sampler is amazing. Great job! Amazing to see all you have accomplished in a month. Love so many. Great picture of the house really shows up well. Thise ugly Christmas sweaters still crack me up.